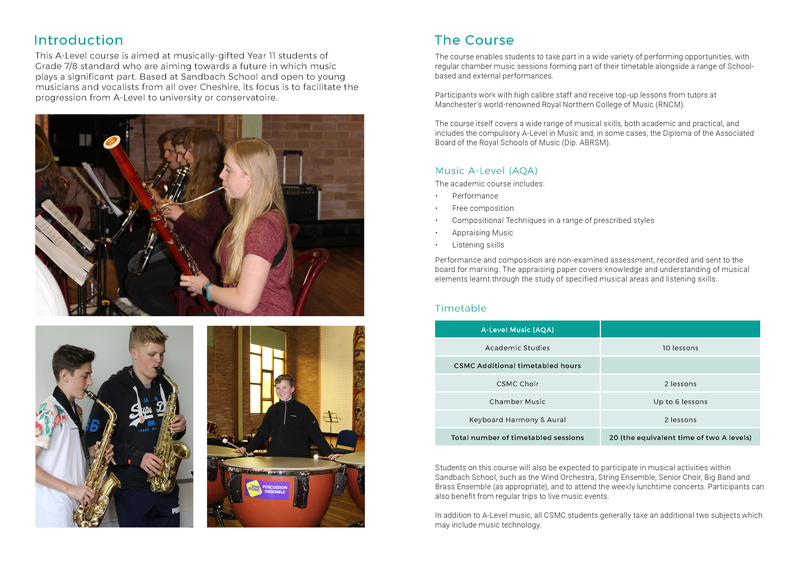 This A-Level course is aimed at musically-gifted Year 11 students of Grade 7/8 standard who are aiming towards a future in which music plays a significant part. 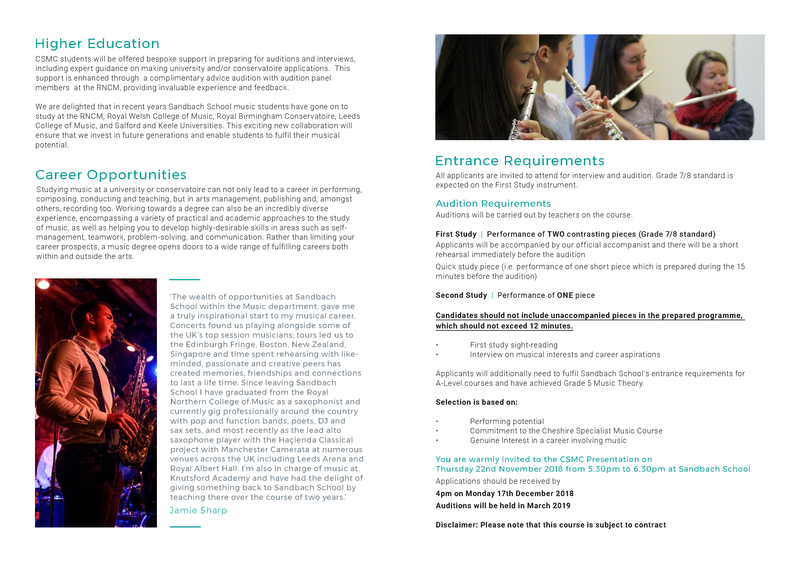 Based at Sandbach School and open to young musicians and vocalists from all over Cheshire, its focus is to facilitate the progression from A-Level to university or conservatoire. 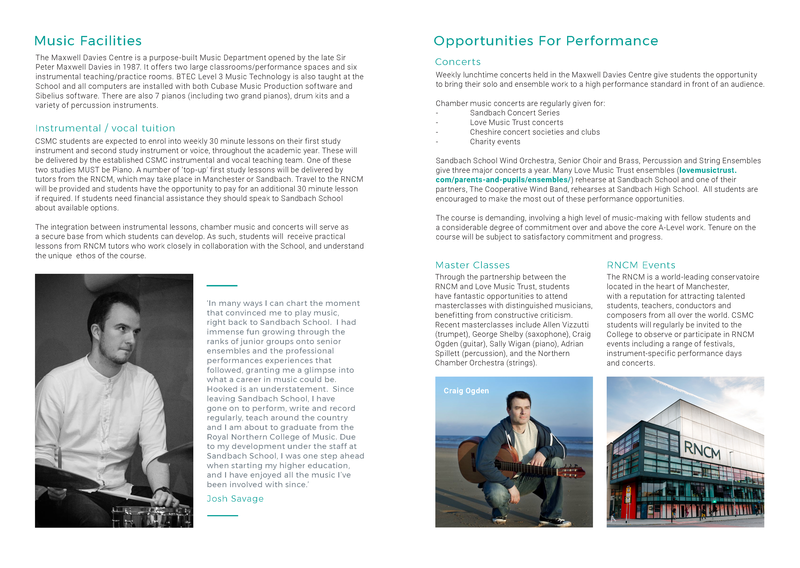 The course enables students to take part in a wide variety of performing opportunities, with regular chamber music sessions forming part of their timetable alongside a range of School-based and external performances. Participants work with high calibre staff and receive top-up lessons from tutors at Manchester’s world-renowned Royal Northern College of Music (RNCM). The course itself covers a wide range of musical skills, both academic and practical, and includes the compulsory A-Level in Music and, in some cases, the Diploma of the Associated Board of the Royal Schools of Music (Dip. ABRSM). Performance and composition are non-examined assessment, recorded and sent to the board for marking. The appraising paper covers knowledge and understanding of musical elements learnt through the study of specified musical areas and listening skills. Students on this course will also be expected to participate in musical activities within Sandbach School, such as the Wind Orchestra, String Ensemble, Senior Choir, Big Band and Brass Ensemble (as appropriate), and to attend the weekly lunchtime concerts. Participants can also benefit from regular trips to live music events. In addition to A-Level music, all CSMC students generally take an additional two subjects which may include music technology.